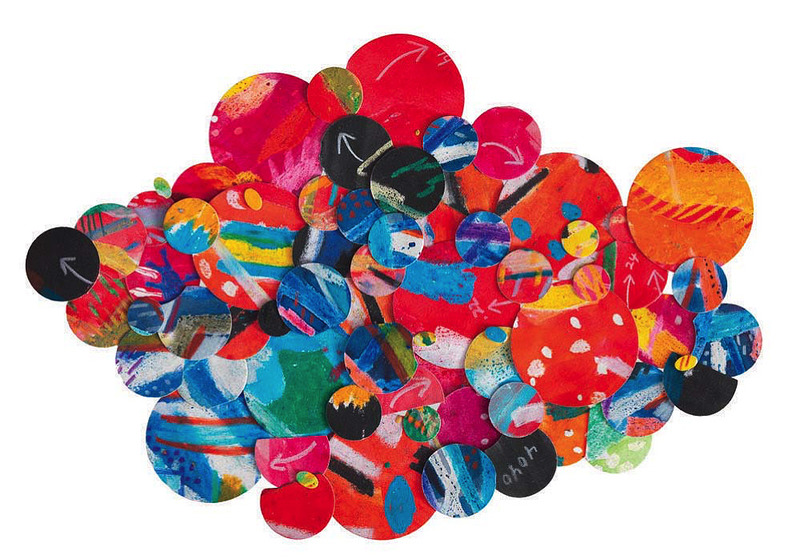 Howardena Pindell: What Remains To Be Seen, a traveling show at the Rose Art Museum,  reveals her ardent experimentation. Across a 50-year career, from figural drawings and abstract paintings to conceptual works and photography, Pindell has played with fantastical color schemes (as in Untitled #4D, above), delved into deconstructionism, and reveled in circles and serialized forms. Works of collaged strips of textiles—ripped, then re-sewn—are painted over. Some are embedded with texts, numbers, or surreal images; others are adorned with glitter, talcum powder, and perfume. In her New York City studio, Pindell has hole-punched thousands of paper dots that she sprinkles or clumps onto canvases, layering on acrylic or spray paint, to create, by turns, raw textures and dreamy, abstract, impressionistic depths. Other multimedia collages reflect both her world travels and her social-justice causes. Her 1980 filmed performance Free, White and 21 examines racism. It marked her return to work after a near-fatal car crash, and an enduring resolve to create.